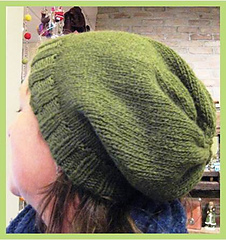 This slouchy hat is right in style! Knit in the round, beginning with a size 8 16” circular needle around the rim, the piece is then moved to a size 9 24” circular as the piece becomes bigger. Double pointed size 9 (or 8) needles are needed to complete the project.